Location: A bit south from the Flaminio metro stop. 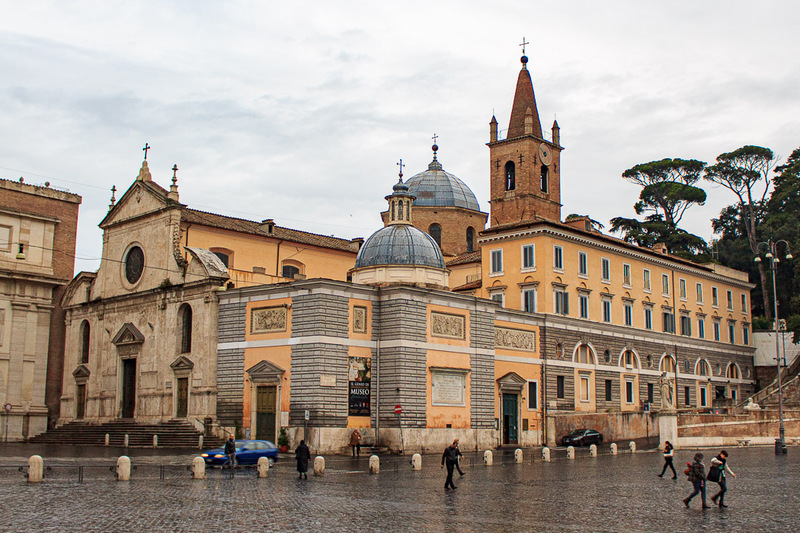 Piazza del Popolo packs a lot of sightseeing attractions into a small area. This was once the spot where you entered Rome if you were approaching from the north. You'd have been walking or riding along Via Flaminia, built by Gaius Flaminius in 220 BC to connect Rome with the eastern coast of northern Italy. 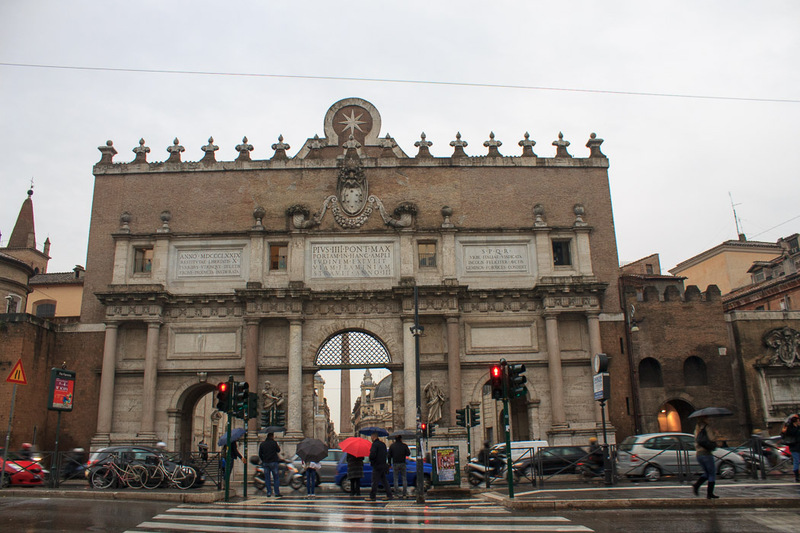 To enter Piazza del Popolo from Via Flaminia, you pass through the Porta del Popolo, once named Porta Flaminia, the gate in the Aurelian Wall at the northern edge of the piazza. 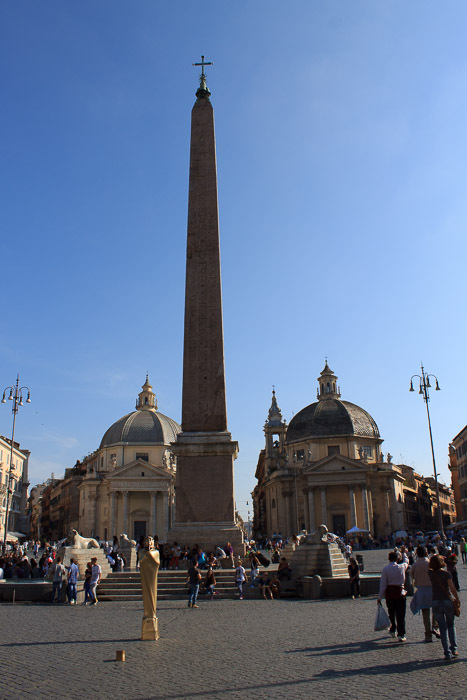 Once you do, you'll see the Flaminian Obelisk in the center of the piazza, with the Fountain of the Obelisk at its base. But for now, just stand at the northern edge of this round piazza, just inside the gate. The church of Santa Maria del Popolo is on your left, and inside you'll find Bernini's superb sculptures of "Habakkuk with the Angel" and the "Prophet Daniel", along with Caravaggio paintings, a great dragon sculpture, and several awesome skeletons. The piazza is bounded on the east and west sides by curved walls which define the edges of the piazza. In the center of the western wall, on your right, is the Neptune Fountain (not to be confused with the Fountain of Neptune in Piazza Navona). In the center of the eastern wall is the fountain of Rome between the Tiber and the Aniene. Leaving the south end of piazza, three streets branch out into the city, forming the so-called trident (il Tridente). Straight ahead of you at the southern edge of the piazza are two domed churches on either side of Via del Corso, the main road in the Campus Martius (northern) section of old Rome, which leads to the Victor Emmanuel Monument about two miles from here. The church on the left is Santa Maria in Montesanto, and the one on the right is Santa Maria dei Miracoli. How many piazzas do you know that can claim three Santa Maria churches? To the left of the church on the left is the Via del Babuino, which leads to Piazza di Spagna and the Spanish Steps. To the right of the church on the right is the Via di Ripetta which leads to the Mausoleum of Augustus and the Ara Pacis. Behind the fountain of Rome between the Tiber and the Aniene you can climb steps that lead to the Villa Borghese gardens at the top of the Pincian Hill and from there you can get a breathtaking view of the Piazza del Popolo and the city beyond, including St. Peter's Basilica three miles away. Once you're up there, it's a very short walk south to the Pincian Obelisk if you're an obelisk completist. Continuing further south along the edge of the Pincian Hill, it's a nice walk to Villa Medici and the Fountain at Villa Medici, site of a most peaceful sunset given to us by Ottorino Respighi in his Roman Trilogy. Then just a few steps past that you'll find yourself at the top of the Spanish Steps. Or, if you're not into this whole Villa Medici / Fountain thing, you can walk back down into Piazza del Popolo and join La Dolce Vita (the good life) stroll which starts each night (best on Friday and Saturday night) around 5 PM in Piazza del Popolo and walk down the Via del Corso with mobs of people from all walks of life who make their way to the Victor Emmanuel Monument, or veer left after 10 blocks to hang out at the Spanish Steps. 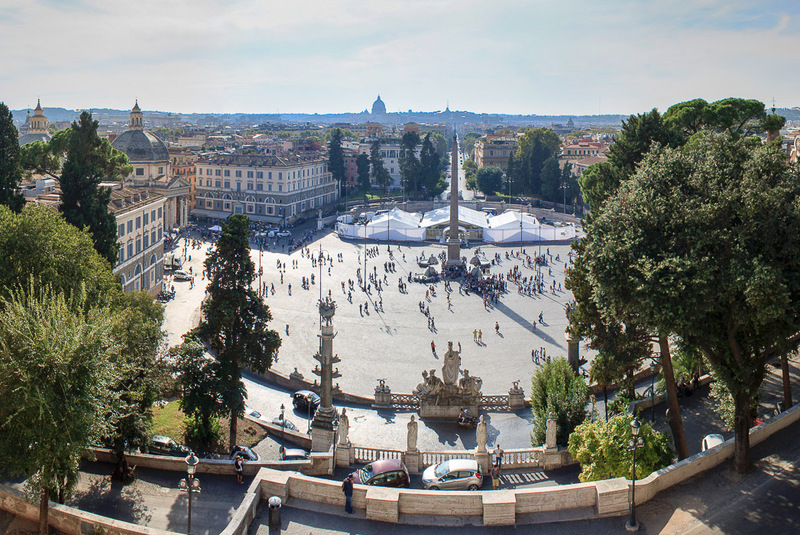 So now that you know what's available, go ahead and walk into Piazza del Popolo and enjoy the sights. See all Piazza del Popolo photos.